Needed a better mitre gauge for table saw. So baught the incra V120 and added this fence. Stop block folds back and slides on T-slot. Extends out to 60”. I got some extruded aluminum T-slot and changed out the wooden fence. Looks great. 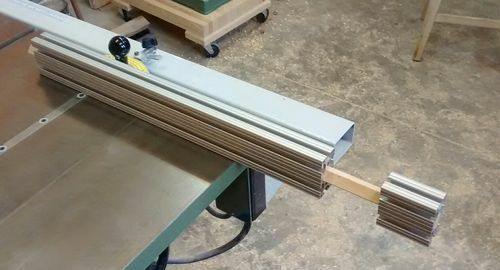 I did the same thing with mine before I built my crosscut sled. wow! 60” seems like a lot. Does it stay pretty square with that much pressure all to one side? I have cut longer than 60” and it has stayed square. I don’t cut anything wider than 8” on it anyway. Any wider than that and I use my big crosscut sled. Maybe the aluminum works better than the wood, but I like what you did with the wood.